Today, information technology (IT) managers and their teams must deal with a more complex environment due to the continuing growth of data, and of requests from mobile and sensory devices that need to interact with the enterprise. IT managers must make choices about how to best prepare for the future to meet these service-driven demands. They must become proactive and agile, while getting the most out of their team’s skills and experience. Changes are happening in record time, forcing IT managers to create strategies to anticipate and address key challenges. IBM® Service Management Suite for z/OS® offers a single point of control for systems management functions, such as visibility, control, and automation, for many system elements. It spans both the hardware and software enterprise resources in an IBM z/OS systems environment. 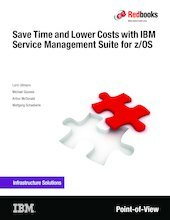 This IBM Redbooks® Point-of-View publication describes IBM Service Management Suite for z/OS (SMSz), and identifies and provides information about its key components. This paper also describes the value that SMSz and these key components provide within the IT environment.